Professor of Literature, John L. Murphy presented the following paper to the American Conference for Irish Studies-Western Region. at the University of Montana, Missoula. 21st Oct. 2016. John L. Murphy runs Blogtrotter. 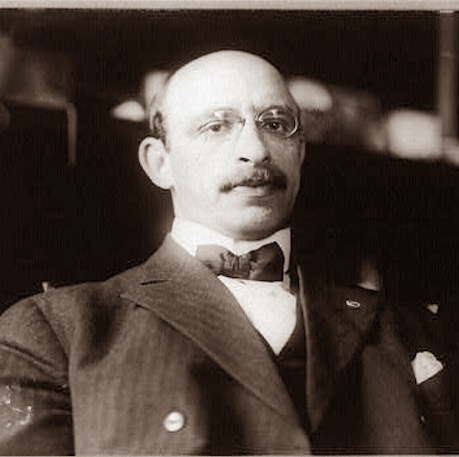 For twenty-nine issues, Alexander Berkman edited The Blast. This revolutionary labour bi-weekly opposed the Great War, capitalism, and colonialism. 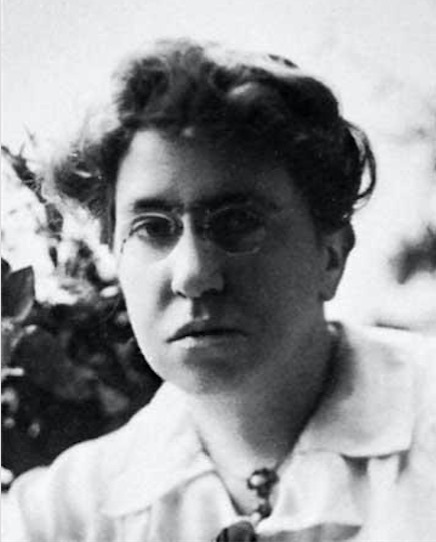 While “Sasha” Berkman’s companion Emma Goldman gains a greater share of commemoration, her fickle lover and devoted comrade merits attention as the Easter Rising and this paper’s centennial coincide. Needing a break from “Red Emma’s” own Mother Earth, with its literary, intellectual, and theoretical bent, Sasha with Emma’s permission decamped from New York City to San Francisco to fire up The Blast as a politically incendiary publication. He began 1916 at 569 Dolores Street in the Mission District. There he and Mary Eleanor Fitzgerald, who had also worked for Mother Earth, set up the press and their domestic partnership. “Fitzi” had fallen in love with that Russian immigrant and notorious would-be assassin, after she left behind her Ohio upbringing as the daughter of an Irish Catholic emigrant and conscientious objector during the Civil War, and an Adventist mother from pioneer stock. Such leftist lineups cheered The Blast’s launch. Introducing its debut, Berkman announces: “Blind rebellion stalks upon highway and byway. To fire it with the sparks of Hope, to kindle it with the light of vision, and to turn pale discontent into conscious social action–that is the crying problem of the hour.” This January 15th edition included Fenian felon turned journalist John Boyle O’Reilly’s poem conjuring up “spectres” of revolutionaries rising, a fitting portent for haunted months ahead. Page two presents Berkman’s fullest expression of the anarchist argument against the Rising’s target. “The Only Hope of Ireland” is absent from the compilation of Berkman’s many publications, and only surfaces on a few activist websites. Yet, it fuels a counter-blast to James Connolly’s prescient warning about switching the Union Jack but for a green flag over a capitalist-run Dublin Castle. Make no mistake, this attempted murderer of Carnegie Steel’s anti-union manager Henry Clay Frick cautions: “the only safe rebel is a dead rebel” as far as the Crown cares. Beyond embittering the Irish people, the American Irish who protest collide with the Church and state which support Britain. To ensure the safekeeping of Sinn Féin captives in the motherland, her exiled discontents might pluck up hostages from among His Majesty’s representatives stationed in America. Ireland’s labour leaders serve as lackeys for their landlords. As in “The Revolt in Ireland” two weeks before, “The Only Hope” concludes by urging the Irish to expand their radical aspirations beyond a clatter of weapons. Outside “the boundaries of the Emerald Isle,” Berkman assures, a global response to imperialism and for liberation will occur, one that erases all despots and opens all borders, at last. The essay’s last sentence evokes imagery reminiscent of the Fenian sunburst flag. It recalls that mythic motif, unconsciously or not, while typifying the trumpeting tone of The Blast. True to the anarchist chant of neither god nor masters, the names of God and nation vanish from this tribute. Rejecting monster meetings or petitions for clemency, Berkman rallies to a cause that transcends any renegade tricolour. The precious blood shed in the unsuccessful revolution will not have been in vain if the tears of their great tragedy will clarify the vision of the sons and daughters of Erin and make them see beyond the empty shell of national aspirations toward the rising sun of the international brotherhood of the exploited in all countries and climes combined in a solidaric struggle for emancipation from every form of slavery, political and economic. Matching the Proclamation by appealing to the men and women of Ireland, it rises above the Republic’s territorial aspirations. Instead, The Blast praises global emancipation. These castigations faded, as another violent act attributed to Irish surnames erupted in a downtown far closer than Dublin. When July 22nd’s Preparedness Day parade in anticipation of entry into the war was bombed, ten San Franciscans died and forty were wounded. The authorities rounded up socialists and anarchists. Tom Mooney, the son of Irish immigrants, and IWW associate Warren Billings were arrested. The Blast found in their case, and those of other defendants, a home front cause célèbre. The writers follow Sasha and Emma’s attitude at that time to terrorism. They explain the “propaganda of the deed” as the last resort of those who have exhausted any hope of achieving their ideals by peaceful means. Berkman and Goldman ease off denunciation. This reply, as with the couple’s rejection of conscription, and Emma’s embrace of contraception, angered Federal authorities, who in 1919 deported both to Russia. Meanwhile, the pair and their allies fought back. The night before the New Year 1917’s issue appeared, a private detective for the United Railroads and the Pacific Gas & Electric Company, accompanied by the Assistant District Attorney, and two of his detectives, raided the office of The Blast. Mary Eleanor Fitzgerald reported in “The Daylight Burglary” how vile their behavior compared to that of “Phadraig Pearse. Jim Connelly, Tom Clarke and the other gallant Irish rebels.” Within the raiders’ ranks numbered a Brennan and a Burke, she adds. Implicitly juxtaposing Hibernian heroes and touts here, Fitzi was also questioned after Preparedness Day along with Sasha the summer before that New Year’s Eve home invasion. In five hours of interrogation at police headquarters, she had to explain why “such a nice sweet lady with such a good Irish name” consorted with Sasha and his insurgent ilk. Roundups against supposed or real “Reds” accelerated after America entered the war in April. The trajectory of the fiery newspaper weakened after a May Day retreat to Emma and Harlem. Only five issues appeared in 1917, ending as June began. Irish concerns diminished as Berkman, Goldman, and 247 fellow-travelers with the far left faced forcible removal back to the countries of their birth. By the end of 1919, detained on Ellis Island, they were exiled from the America whose immigrants they had joined, and whose traditions they admired and challenged. Larkin, jailed in Sing Sing, would be pardoned, then deported, in 1923 by Al Smith. Big Jim’s fate intersects with Irish rebels who escaped after the failed Rising to America, but who likely less often than Larkin and his like lashed out with such radical furor and fervent dissent against injustices they found in their second homeland and new refuge. Anarchism barely registered back in Ireland, amid red-baiting and moral panic. Reformist or conciliatory methods endured, as demonstrated by Larkin’s drift to the Labour Party in the Free State. Compromises characterised too the partitioned Irish Republic, testimony to class-based divisions on the island and beyond, past 2016. Avrich, Paul, and Avrich, Karen. Sasha and Emma: The Anarchist Odyssey of Alexander Berkman and Emma Goldman. Cambridge MA: The Belknap Press/Harvard University Press, 2012. Pateman, Barry, intro. The Blast. Edinburgh, London, Oakland: AK Press, 2005. 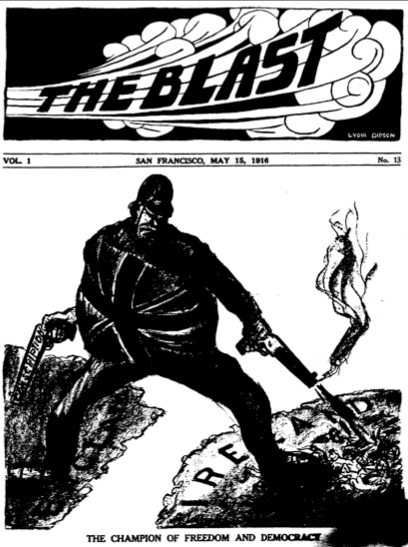 The Blast was a San Francisco based newspaper published by Alexander Berkman in 1916-1917. It’s main focus was on the trade union movement in California, as well as covering national labour events, and educating its readers about anarchism. It also covered a broad range of topics such as Mexican revolutionary Pancho Villa, the trial of trade unionists Tom Mooney and Warren Billings for the Preparedness Day bombing, and the growing ferment in Europe. Margaret Sanger, on trial for giving out information about birth-control, wrote on women’s rights and family planning. The paper’s anti-militarism was not ignored by the authorities and the paper was shut down in June 1917 when Berkman was jailed for “inducing persons not to register” for the draft. This was written in the aftermath of 1916 rising, just three days after the execution of James Connolly.